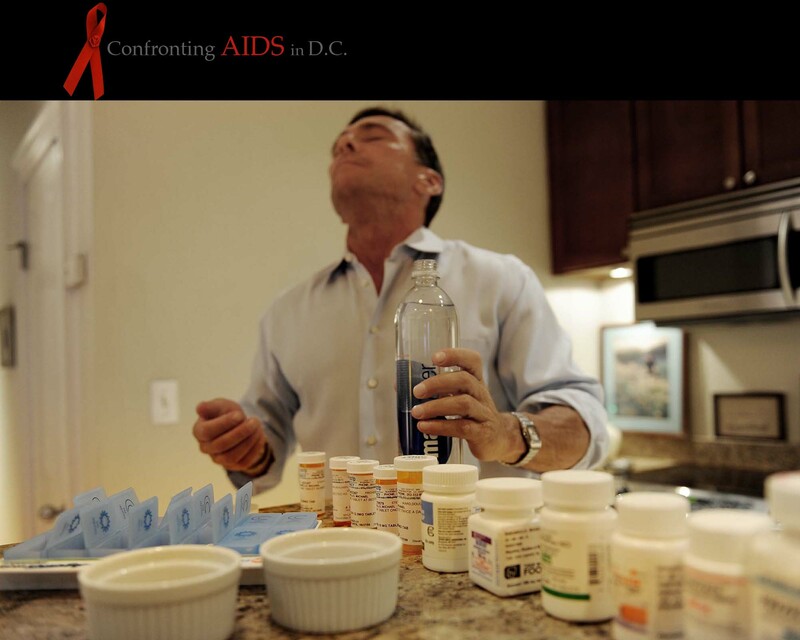 AIDS around the world: CONFRONTING AIDS: CONFRONTING AIDS in D.C.
Michael Manganiello, 50, prepares his evening routine in the warm glow of his fifth-floor Logan Circle apartment. He's been through it once already: one, two, three . . . the pop of a bottle, then the rattle of pills, as he counts them out . . . 11, 12, 13. He ponders the number: "Thirteen — unlucky," he murmurs. Between morning and evening, he takes a total of 27 pills these days. Manganiello grasps a handful, puts them into his mouth, takes a swig of water and swallows. He pauses for a moment, then repeats the ritual with the remaining tablets. "I found out I was positive in 1987. It's been 21 years. Long time," he says. the ’90s his viral load levels soared, indicating the virus was progressing quickly. "I was a viral millionaire," he quips. A partner in the health-care consulting firm HCM Strategists, Manganiello considers himself lucky to be among the few hundred patients taking part in a National Institutes of Health clinical trial investigating interleukin-2, a drug that booststhe immune system when it is under attack by HIV. "The bad thing is that there is this perception that it's a chronic manageable illness and it's not so bad if you get it. That's not the case," Manganiello says. "In some ways it's still a death sentence. It's an incurable disease that's progressive."